On March 15, the Incheon City Council angered conservative South Koreans by passing an ordinance that called for compensating families of natives of Wolmi Island who died or had to leave their hometowns due to bombing by U.S. and UN forces during the Incheon landing operation on September 15, 1950. 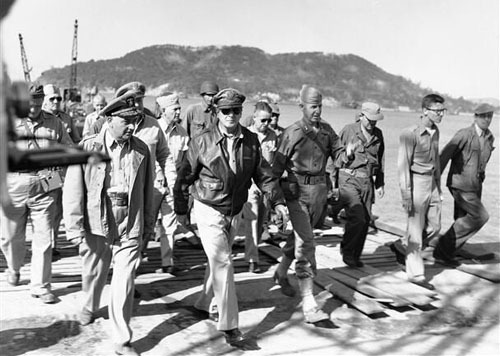 Gen. Douglas MacArthur at the Incheon landing. Wolmi Island is in the background. The “Ordinance on the Livelihood Stabilization Support for the Victims of the Past” is the third attempt by the city council to sue the United States for damages from the operation which stopped North Korea’s advances on the South, the East Asia Research Center reported on March 26. Currently, 34 of the 37 Incheon City Council members are members of Moon’s ruling Deobureo Minjoo Party, and all seven of the Planning and Administrative Committee are party members, the report said. “The Moon Jae-in administration cannot say a word to the war criminal North Korean [regime], but acts in concert with non-governmental groups that demand compensation from the UN, which helped us. Is that the ‘just’ society that the Moon administration talked about?” Jeon Hee-Kyung said. Wolmi Island is no longer an island as it is physically connected to the City of Incheon by land reclamation, the report noted. A lawsuit filed in Incheon District Court in February 2011 demanded the U.S. government and the UN compensate $2,600 per each Wolmi Island native household for a total of $119,000. The lawsuit failed.